Dos Passos and the Ideology of the Feminine is an original contribution to traditional Dos Passos scholarship, which tends to focus on the author's political agenda. In this book, Janet Casey takes a cultural studies approach that situates both the author and his finest fiction in relation to representations and theorizations of gender in the 1920s and 1930s. 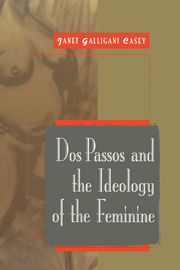 Its primary focus is the manner in which Dos Passos responds to prevalent ideas about the feminine, as well as the way that such ideas have affected his ongoing reputation. Introduction; 1. Critical Legacies: Political, Literary, Personal; 2. Framing the Issues: The Feminine in the Early Fiction; 3. Manhattan transfer and 'The Center of Things'; 4. Ideology, the feminine, and USA.